Industry Experts, Inc. unveiled the new global market report on Pectin. As per this market research report entitled "Pectin – A Global Market Overview", Food & Beverages segment accounts for more than 90% of Pectin’s consumption globally, estimated at 60 thousand metric tons in 2018. Major application for pectin is as a gelling agent, thickening agent and stabilizer in food & beverages while also used in cosmetics, personal care products, pharmaceuticals and nutraceutical products. Among different food & beverages applications, jams/jellies occupy the largest share of pectin consumption globally. Technical advancements in pectin products have made possible to create a shelf-stable and low-pH diary beverages such as drinkable yogurts and milk-juice blends. Further, increasing consumption of pectin in dairy products is forecast to drive the pectin market. The global Pectin market report analyzes the key end-use applications of pectin including food & beverages, cosmetics & personal care and pharmaceuticals & healthcare. This study also analyzes the key sub-segments of food & beverages applications of pectins consisting of jams/jellies, dairy products, non-dairy beverages and confectionary. 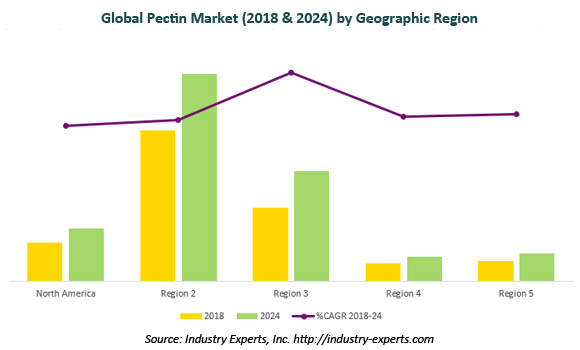 The global markets for the above-mentioned pectin end-use applications are analyzed in terms of volume in metric tons and value in USD for 2015-2024 analysis period. The report reviews, analyses and projects the Pectin market for global and the regional markets including the North America, Europe, Asia-Pacific, South America and Rest of World. These regional markets further analyzed for 24 independent countries across North America – the United States, Canada and Mexico; Europe – France, Germany, Italy, the Netherlands, Poland, Russia, Spain and the United Kingdom; Asia-Pacific – China, India, Indonesia, Japan, South Korea, Malaysia and Thailand; South America – Brazil and Argentina; and Rest of World – Saudi Arabia, South Africa, Turkey and Ukraine. This 276 page global pectin market report includes 214 charts (includes a data table and graphical representation for each table), supported with a meaningful and easy to understand graphical presentation, of the market. This report profiles 8 key global players and 24 major players across the North America – 8; Europe – 10; Asia-Pacific – 5; and South America – 1. The report also provides the listing of the companies engaged in research & development, manufacturing and supply of pectin. The global list of companies covers addresses, contact numbers and the website addresses of 60 companies.